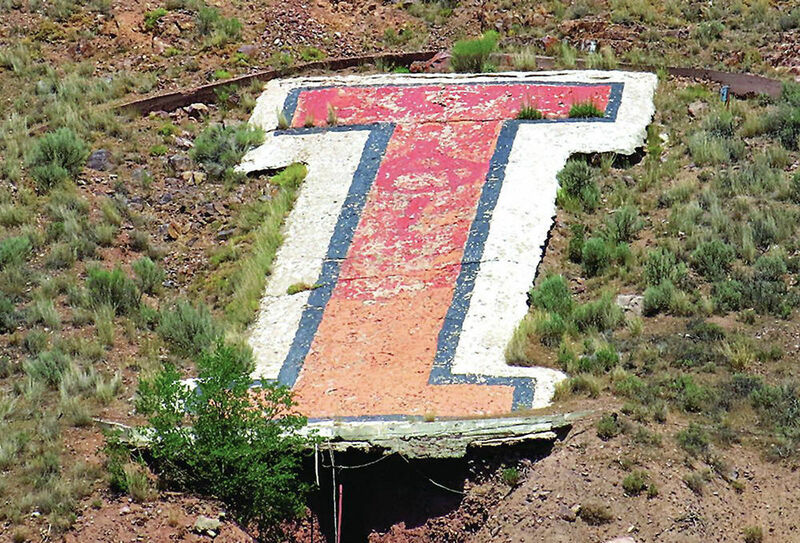 Idaho State’s former Red Hill “I” was removed in 2014 due to safety concerns. Four small squares colored orange and two larger orange squares on the right showed where the new Idaho State University “I” would be placed on Red Hill. The prototype was on display for about a week. POCATELLO — Idaho State University officials have taken another step toward reinstalling the iconic “I” on Red Hill — a goal they hope to achieve this summer. They recently placed a prototype on the hill, just above the location of the original “I” that was removed five years ago due to erosion and safety concerns. The prototype, which was up for a little more than a week, was made of a fiberglass grate material. It should allow water to run through the panel and limit erosion on the hill, said Stuart Summers, associate vice president of marketing and communications at ISU. “The prototype was placed on Red Hill to help us to determine if the grate material will meet our needs and be visually appealing,” Summers said, adding that university officials wanted to see how it would look from a number of locations around Portneuf Valley. Krystal Chanda, a professional engineer and principal with Pocatello-based A&E Engineering, proposed the use of the durable composite grating made of plastic reinforced with fiberglass. Fibergrate is used to build walkways and platforms in industrial settings and it withstands the elements, Chanda told the Journal in December. Summers noted that the prototype was orange in color, but was not the same shade that will be used in the final construction. However, the location was correct. “The site on Red Hill that (had) the prototype is the permanent location being considered,” he said. ISU officials have asked the campus community to provide feedback about the construction material and location. People can send their thoughts via email to comments@isu.edu, Summers said, adding that all feedback will be taken into consideration. Summers said they’ve talked about the possibility of lighting up the “I” in the future, but they don’t have any plans to do so at this time. For now, university officials are focusing their efforts on simply reinstalling the “I”. Summers said university officials are working with the Department of Public Works to finalize their next steps. Their preliminary plan is to ask their own engineering department staff and students to help with the project, but have an outside service contractor do the actual construction. Although the project has been estimated in recent months to cost roughly $300,000, Summers said they don’t have solid numbers yet. “A final cost will be factored after we have an agreement in place with a service contractor,” he said, adding that the funds likely will come from university reserves. They also have alumni who have expressed an interest in financially supporting the project. Summers said the university will share updates in the future as plans are finalized. In the meantime, he’s happy the project is moving forward. Summers noted that alumni have sought to replace the “I” ever since the original icon, which had been a fixture on campus since 1916, was removed in 2014. A campus action team was assembled in July to expedite plans and ISU President Kevin Satterlee has expressed his commitment to seeing the project through to completion. Summers said they’re excited to bring back the beloved icon.